Recipes for a healthy, real food, vegetarian life. 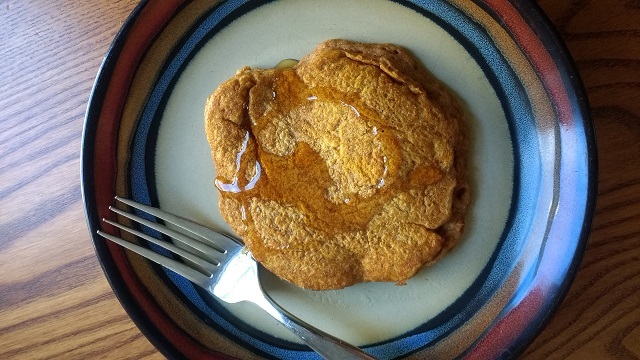 Whole Wheat Pumpkin Pancakes Vegan and Fat Free! Happy Halloween! There's no better way to celebrate today than to whip up some of these pumpkin pancakes. I had a partially used can of pumpkin puree sitting in the fridge that I wanted to use up. I immediately thought of pancakes. The pumpkin puree in this recipe not only provides delicious autumn flavor, it also eliminates the need for eggs or oil, making this recipe both fat free (as long as you choose to cook it with a small amount of nonstick spray) and vegan! This recipe was a huge hit with the littlest member of the family. I feel really good about that considering that pumpkin is high in so many important nutrients, including vitamin A. I topped her portion with a little bit of peanut butter, she covered it in applesauce as well. 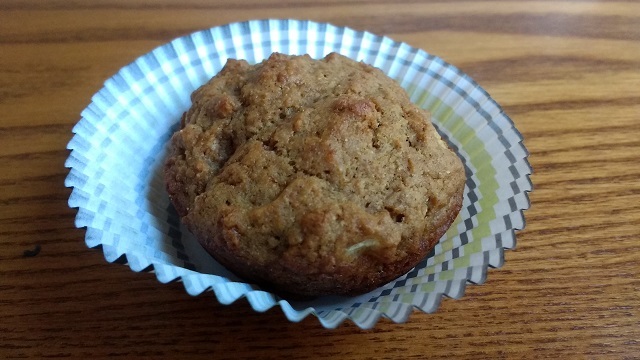 Whole Wheat Double-Apple Cinnamon Muffins Completely Vegan! We had a few apples laying around just asking to be baked into perfectly delicious apple-cinnamon muffins (well, not literally...that would be creepy-but very much in the spirit of Halloween). It occurred to me that I could use some applesauce to replace the eggs (hence the double in the name) making them both extra apple-y AND vegan! 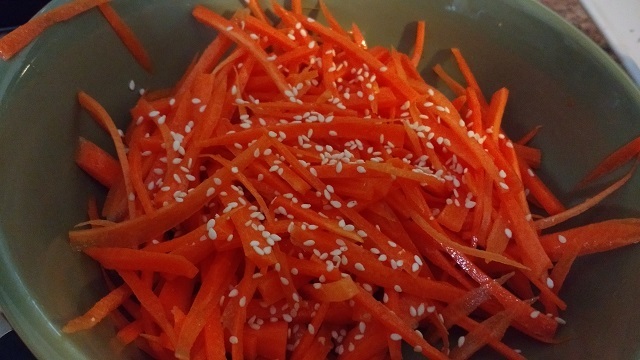 Sesame-Carrot Slaw I wanted to make a small side dish to go alongside our dinner of orange tofu the other night. I simply julienned up some carrots (although, you could certainly shred them in a vegetable grater if you so desired) and mixed together a dressing of apple cider vinegar, sesame oil, and canola oil. I sprinkled the top with sesame seeds and called it a day. Sometimes it's nice to have really simple side dishes and salads to pair with other foods. Ingredients:2 carrots, peeled and julienned2 tsp canola oil1 tsp sesame oil1 tsp apple cider vinegar1 tsp sesame seedssalt to taste Directions:Place the carrots in a medium serving bowl.In a small bowl mix together the canola oil, sesame oil, and apple cider vinegar. Toss the dressing with the carrots.Sprinkle the top with sesame seeds. 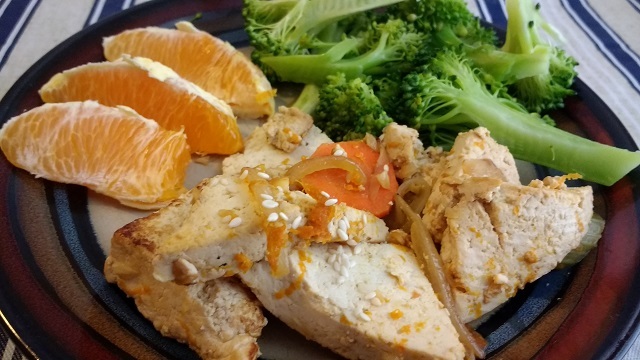 Healthier Orange Tofu Orange tofu or orange chicken in a American Chinese restaurants are usually breaded, deep fried, and smothered in a thick syrupy sauce. Not exactly the kind of meal I want to eat on a regular basis. This version has all of that great citrus flavor, thanks to the zest of the orange in the sauce without all of the unnecessary extras. This recipe is somewhat different from the Sesame-Ginger-Tofu that I posted about in a couple of ways. In addition to the difference in flavor from the fresh orange zest, the tofu is quickly stir fried, not baked. If you prefer a less tofu-y texture you may want to follow the instructions for baking the tofu outlined in that recipe. Personally, I enjoy the natural texture of tofu. Serve this with steamed broccoli and orange segments (you have to buy an orange for the zest anyway) or alongside some fried rice. Vegan Green Smoothie Lots of parents worry about getting enough vegetables into their kids (or themselves for that matter). We have had lots of smoothies in this family, but all have been heavily fruit based. I wanted to make something which would help all of us get a little bit more veggies into our morning. 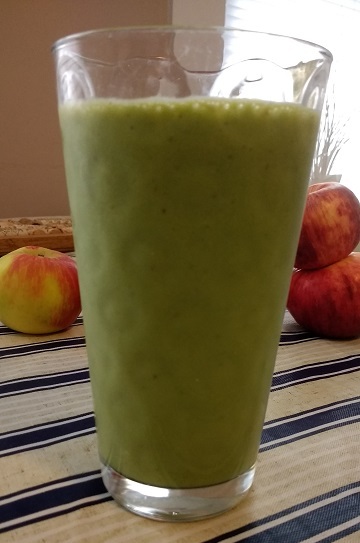 I have seen many recipes for "green smoothies," but I wanted to make something that was extremely simple (for when we are half awake). This recipe only calls for four ingredients: spinach, fruit, soy milk, and maple syrup (or whatever you wish to sweeten it with). Alternately, you could use a sweetened milk and skip the sweetener altogether. We had these with some pesto and carrot noodles. You could put them on zucchini noodles, spaghetti squash, or whole wheat pasta and top with any pasta sauce. 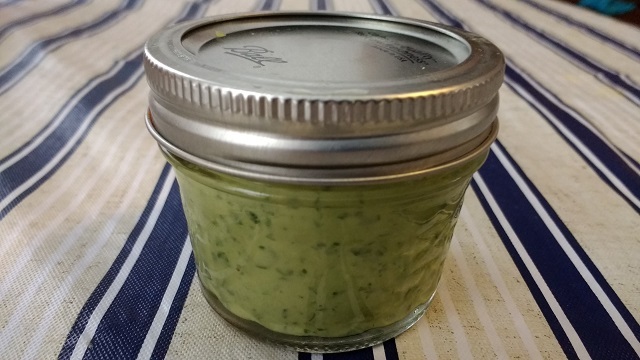 Vegan Pesto Sauce This vegan pesto sauce is not fat free, but it's not all oil either-it's somewhere in between. It is made with a combination of olive oil and vegetable broth that gives it a nice deep flavor. Pine nuts give it a classic pesto texture. We had in on carrot noodles (carrots strips made with a vegetable peeler). It would be equally delicious on zucchini noodles or whole wheat pasta. Ingredients:1/2 cup basil leaves, tightly packed2 TBSP pine nuts2 TBSP olive oil1/4 cup veggie broth (home made or salt free)1 clove garlic, peeled1 tsp fresh lemon juicepinch saltdash pepper Directions:Place all of the ingredients into your food processor. Blend until smooth. Pour it over pasta, rice, or veggies! 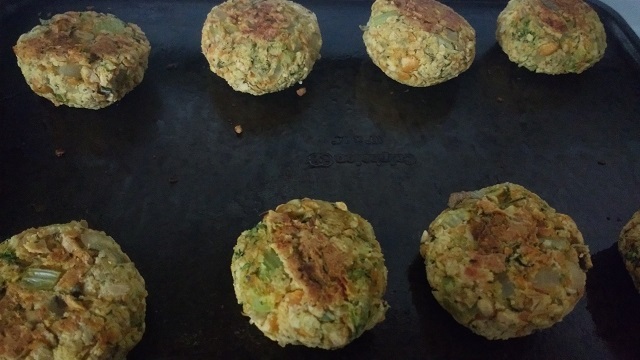 These patties are a mix of chickpeas, zucchini, carrots celery, onion, garlic, fresh sage, and other herbs. Oatmeal is the binder, so they are completely gluten free. All of the ingredients are totally plant based, so this recipe is also vegan. 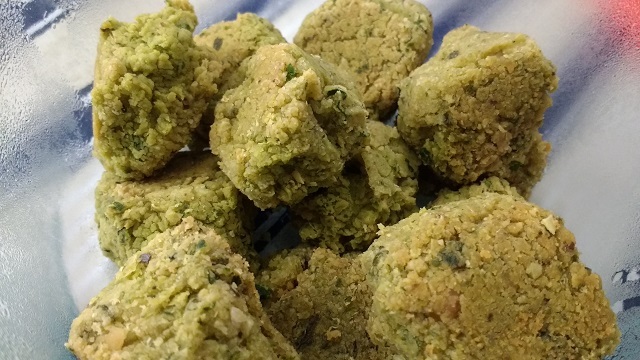 They have the texture of falafel, but they taste like thanksgiving dinner! We had them with steamed zucchini, and vegan mashed potatoes. Yum! Then you fry them in a pan with a little salt to reduce the moisture (this will improve the taste and texture of the finished product. Mix all of the ingredients together in a mixing bowl. Then, just form the patties and bake! Easy Veggie Fried Rice Fried rice doesn't have to be unhealthy for you. This version is lighter, fresher, and tastier than the original. Brown rice adds fiber, grated and diced veggies add in vitamins, and the peas add in protein. The flavor of this rice is enhanced by sesame oil and a touch of soy sauce, but most of the flavor comes from the veggies themselves. My two year old was enthralled by the chopsticks, and insisted eating with them. Ultimately, we ended up feeding her with the chop sticks, but she did like this recipe quite a bit. This recipe cooks up super quick, so make sure that you have prepped all of your vegetables before you begin. 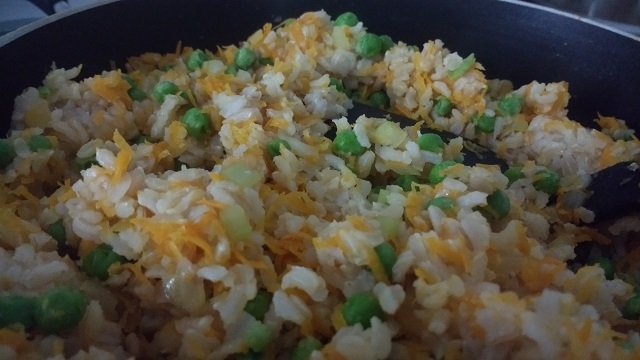 If you make the rice ahead of time, or are making this dish with leftover rice this would make a very quick and easy weeknight meal. If this is intended as a main course, just double the peas or stir in some tofu. 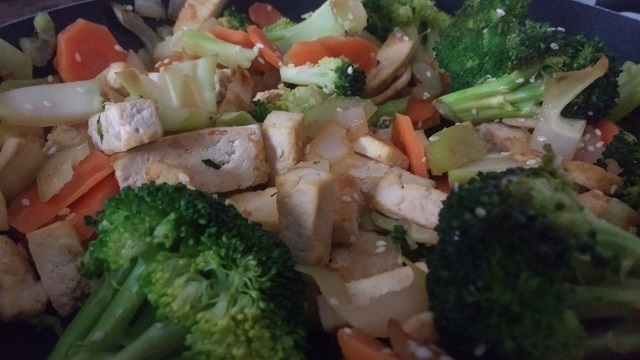 Sesame-Ginger-Tofu Stir Fry Tofu stir fry is one of those recipes that every vegetarian needs to have in their repertoire. Tofu is full of lean protein, and the veggies are full of vitamins and minerals. It's an all around great meal. Tofu is one of my toddlers favorite foods (lucky, I know), so we have this dish and variations on it quite a bit. This recipe has a couple extra steps than your average stir fry, but they are well worth it, plus stir fry cooks up so quickly that you have the extra time. The tofu is pressed, then baked for superior texture. The broccoli and carrots are steamed (very lightly) because, I find, that steaming develops their flavors better than frying. 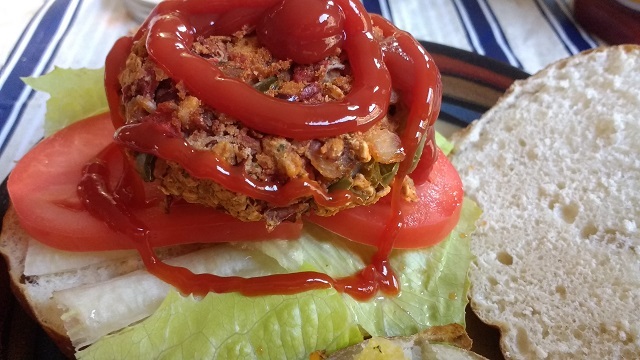 Chili Burger Vegan and Gluten Free! Once a week or so, I like to make a home made veggie burger for dinner. I wanted to create something with a bold and classic flavor profile, like a bowl full of chili. Kidney beans, tomatoes, bell peppers, garlic, onions, and herbs and spices come together to make that great chili flavor. I think I replicated that flavor pretty well in this burger. Because the recipe calls for canned beans and tomatoes, you can whip up this burger pretty quickly. You could even make the patties the night before, or on the weekend. Then you just have to preheat your oven and pop them in when you get home from work. I decided to try and use quick oats as my binder in this recipe. Honestly, I think I like it better than breadcrumbs or flour. The oats pick up the the other flavors much better than wheat products do, in my opinion. So, if you are gluten free, this is the burger for you! Cinnamon-Apple Sauce We still have a few apples kicking around from the last time we went apple picking. 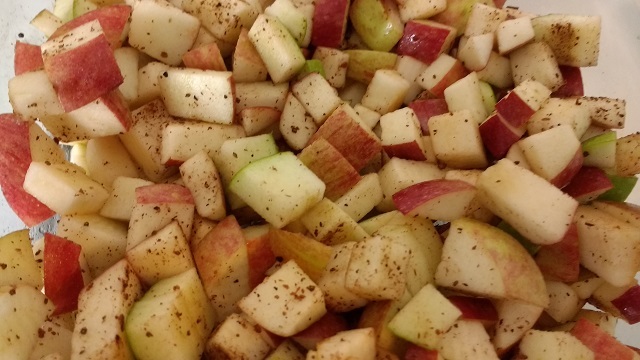 Sad, bruised apples that was going to eat... What better way to give them new life than applesauce? This applesauce is completely sugar free. I used a little bit of canola oil to grease the casserole dish to prevent the apples from sticking, but you could use nonstick spray or whatever you happen to have on hand. I left the skins on my apples for a little extra nutritional boost, but you could peel yours. When I asked my taste tester (my toddler) to try a bite her eyes opened wide. She immediately asked for a bowl. Applesauce made from scratch is a whole other level of delicious, trust me. Better yet, make some for yourself. Split Pea Soup This soup made a nice hearty dinner the other night. Add a whole wheat dinner roll or a salad, and you are all set! It is a pretty small batch, it makes enough for about three or four people. If you want leftovers, double the recipe. This meal is extraordinarily economical. Split peas are about a dollar/bag, and the vegetables are not very expensive. If you make your broth from scratch, you will have quite the budget meal! 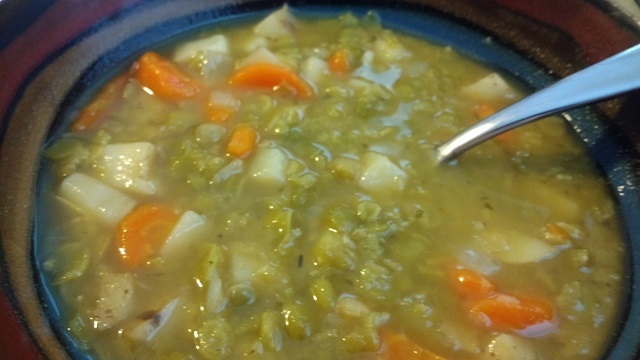 Split pea soup is a great option for baby led weaning. My toddler absolutely loved split pea soup when she was a baby. 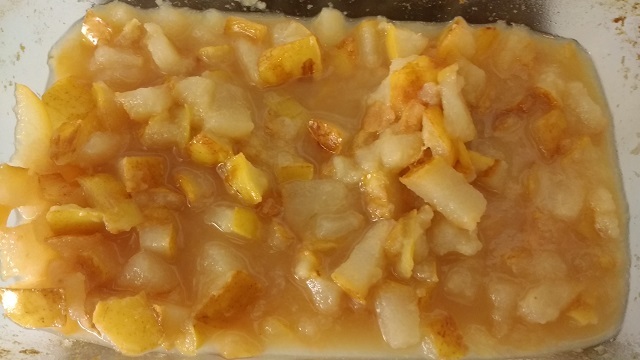 Baked Ginger-Pear Sauce Recently, I found myself in possession of a few overripe pears. Not wanting them to go to waste, a decided to whip up a batch of pear sauce. I was very happy with the results! There is no sugar in this sauce. It really doesn't need it! Oil is minimal, only a little to prevent the pears from sticking to the pan. You could use nonstick spray or whatever you have on hand. 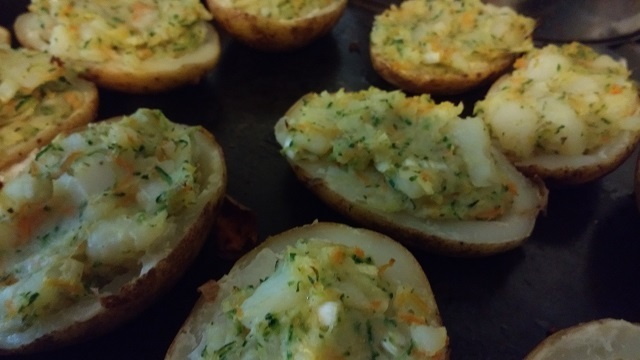 Veggie Loaded Twice Baked Potato Potatoes were buy one get two free at the store, so right now we are swimming in potatoes. I wanted to create a fun delicious recipe that would balance some of the starch with some healthy veggies. I was very happy with the result. I happened to have carrots, zucchini, and onion in my refrigerator. There is no reason that you have to be limited to these veggies, however. Use whatever you have on hand, just make sure that you end up with a total of about 1 1/2-2 cups of veggies total, and that they are either shredded or diced fine. If you want a mellower onion flavor, try frying the diced onions in 1 tsp of the oil before you mix them with the other vegetables. Then, reduce the oil you add to the potatoes by 1 tsp. Veggie Scrap Broth Every soup needs a strong base, but there is no reason to spend a ton of money on broth. It is not only easy to make broth from scratch, it is practically free. 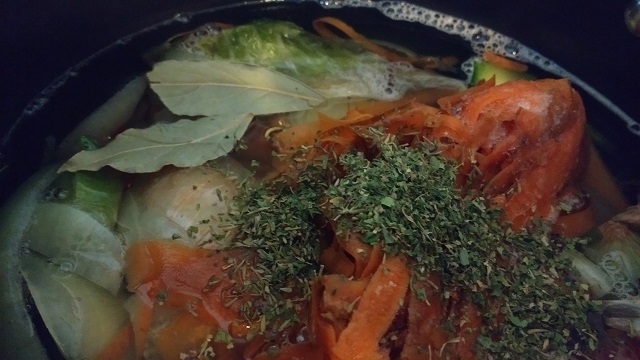 I only recently started making broth this way, at the advice of a friend. All you need to do is keep a large zip top bag in your freezer. Whenever you are chopping, dicing, or peeling, simply toss the scraps that you would otherwise throw away into the bag. When the bag fills up, you are ready to make broth, my friend! One of the wonderful things about this idea is that it makes a new broth every time you make it. Last time I made broth, I had lots of butternut squash skins to use up. It had an amazing aroma, and a very deep flavor. Who knows what kinds of flavors you could make up? Asparagus, broccoli, pumpkin, the possibilities are endless!